Interior Landscape. Photo tour through the exhibition in Venice, parallel to the 53rd Biennale. Interior Landscape by Mona Hatoum, which opened on 4th June 2009 at the Fondazione Querini Stampalia, is without doubt one of the most interesting exhibitions which run parallel to this year's Venice Biennale. 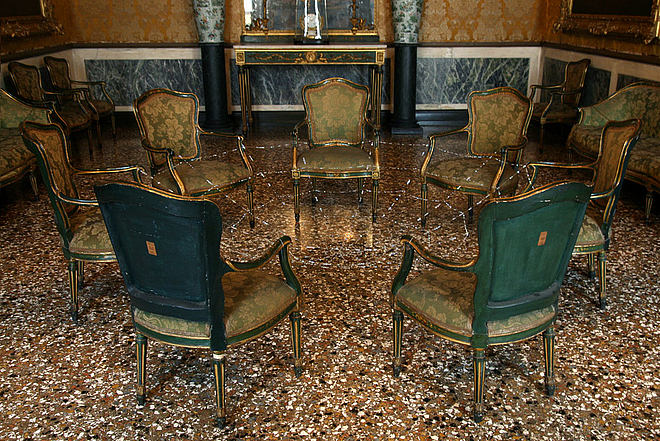 Curated by Chiara Bertola, the shows features almost 30 works, presented in the contemporary exhibition spaces of the third floor, as well as in the second floor of the historic building, formerly the home of the Querini Stampalia family, where Mona Hatoum has created several interventions in a subtle dialogue with the museum's collection. The project is part of an ongoing series initiated by the Foundation entitled Conservare il futuro (Preserving the Future) that focuses on the relationship between historic and contemporary art – between "the past that needs to be preserved and the future still to be planned." Mona Hatoum's new works in Venice include the installation Interior Landscape, after which the exhibition is named, an austere bedroom that "imagines the conflict between the dreams and aspirations of a Palestinian individual juxtaposed with the harsh reality they have to face." Inspired by the "Triumph of Beauty", the centerpiece of the porcelain dinner service that can be seen in the house-museum of the Querini Family, Hatoum has turned Beirut's war memorial into a porcelain statuette, Witness (2009), but leaving the holes and destruction marks that the original monument bears.